Preferred Habitat: Woodlands and suburban gardens. Breeds in our area. Seasonal Occurrence: Abundant throughout the year. 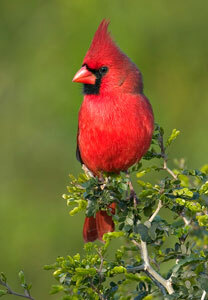 The Northern Cardinal is one of our most easily recognized birds. It is a permanent resident in our area. 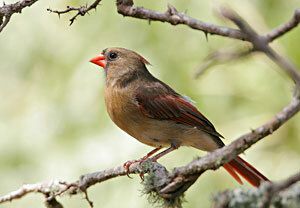 Adult female cardinals are tawny brown with red beaks; immatures are similar to adult females but have dark bills. The cardinal song is a clear whistled cheer, cheer, cheer, with many variations. Cardinals aggressively defend their territory. The Houston Audubon Society often receives calls from anxious Houstonians, worried about cardinals attacking their house windows. The cardinals are seeing their reflection and trying to ward off an imaginary rival. Closing curtains or blinds is the best way to prevent such behavior. Cardinals adapt easily to backyard habitats. They eat primarily seeds and berries, such as beautyberry. In winter they relish the seeds from tall wildflowers, grasses, and shrubs such as ruellia and Texas star hibiscus. They also eat a variety of insects. Cardinals readily come to sunflower seed feeders and bird baths.